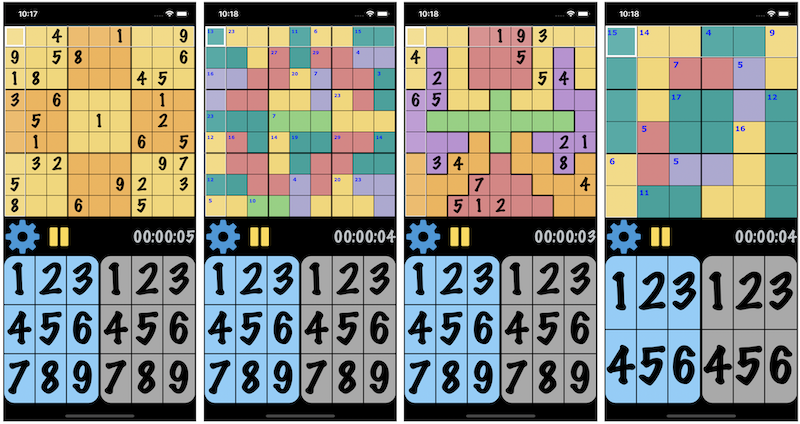 The best Sudoku game on the iPhone, iPad and Mac OS! Enjoy our extensive selection of sudoku games, with types / difficulties and sizes to suit everyone ranging from first timers to seasoned experts. Whether you prefer the traditional 9x9 Sudoku, or something a little bit more exotic like Jigsaw / Killer, we have games to suit your every desire and whim. Multiple difficulty levels (up to 9) and sizes. All games can be solved using logic techniques. No guessing is required! Designed by Sudoku players for Sudoku players! 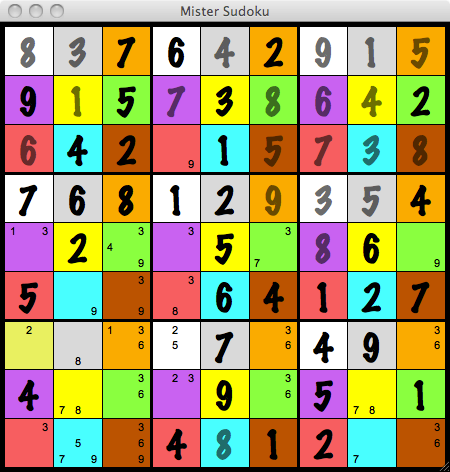 Mister Sudoku provides a lot of game types in different difficulties so that there is a Sudoku puzzle to solve for anybody!! Check out the different game types!! 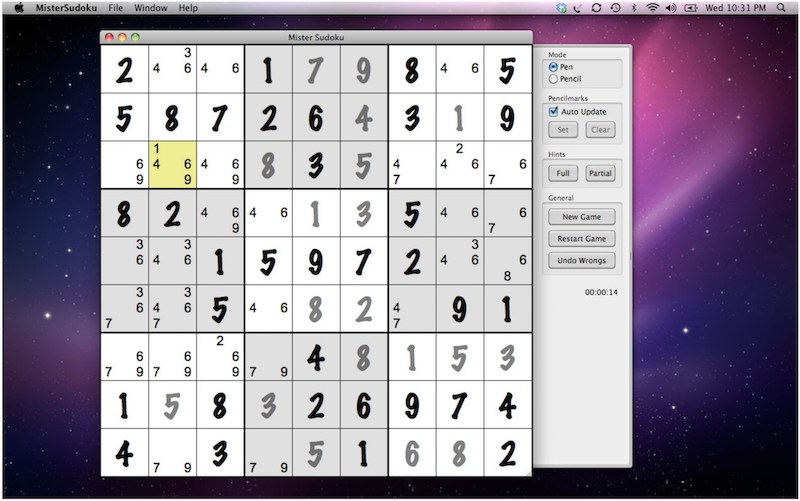 The concept of Sudoku is simple. The (standard) puzzle consists of a 9x9 square grid that is divided into nine 3x3 squares, resulting in nine rows and nine columns, for a total of 81 small squares. 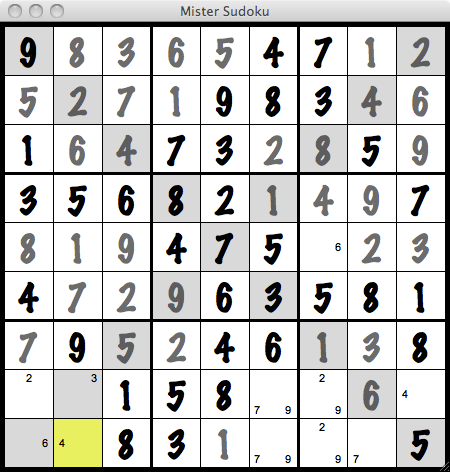 The unsolved Sudoku puzzle supplies only a few numbers in random squares. To solve the puzzle, the remaining squares must be filled in with the numbers 1 through 9, each appearing only once in each row, column and 3x3 square. 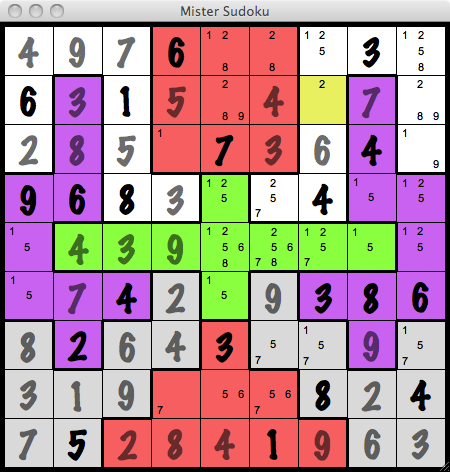 This is another very basic technique for solving Sudoku puzzles. While considering what digits from 1 to 9 are possibly placed in an empty cell, one would first find out what digits have appeared in the common row, column and the 3x3 box with this cell. If eight out of nine digits have been used, then the other one digit left must be in this cell. When examining a 3x3 box, one might find that one digit is locked in a specific row (or column) of that box although the exact position cannot be determined yet. This information leads us to confirm that such digit cannot appear in other positions of the same row (or column). 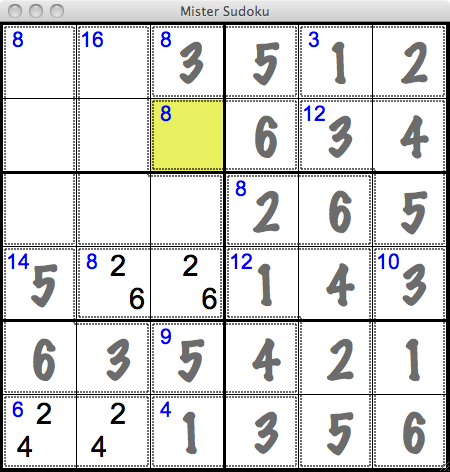 In a Sudoku puzzle, if two cells in the same row have exactly the same two digits as possibilities, then such two digits must be in either one of these two cells and cannot be candidates in any other cells of that row. The same reasoning can be used for any columns and any 3x3 boxes. The technique is called naked pair. This technique can be applied to more than two digits. It is called naked triplet if three digits are involved and naked quad if four. The number of cells must be the same as the number of digits. But each of the digits involved need not be a candidate of all cells. In other words, each cell has a subset of the digits involved as candidates for that cell. 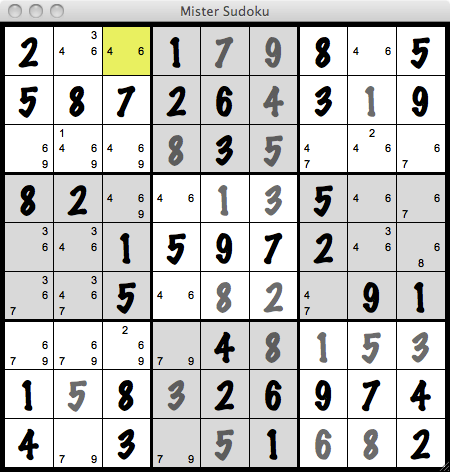 In a Sudoku puzzle, if two digits are candidates for the same two cells in the same row and not for any other cells of that row, then such two digits must be in either one of these two cells and other candidates in those two cells can be eliminated. The same reasoning can be used for any columns and any 3x3 boxes. The technique is called hidden pair. This technique can be applied to more than two digits. It is called hidden triplet if three digits are involved and hidden quad if four. The number of cells must be the same as the number of digits. But each of the digits involved need not be a candidate of all cells. 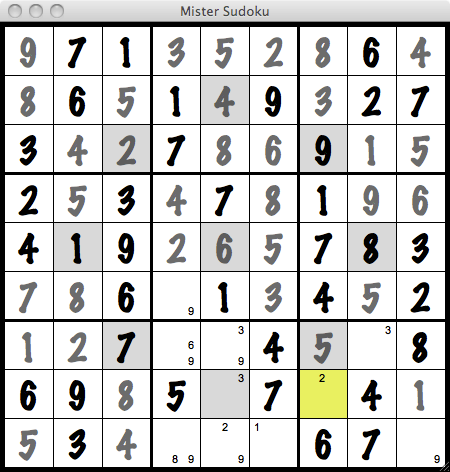 "At last I have found an app that gives me all of the sudoku options that I enjoy. The scoring system helps to make the games addictive." 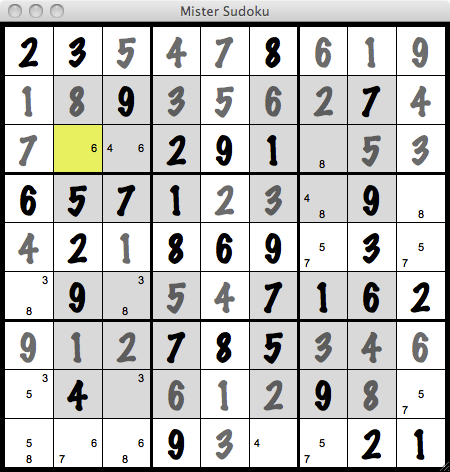 "Great killer sudoku. Same for all the sudoku varieties. I really enjoy this app." "Très bonne conception jeu très complet formes niveaux etc... Je recommande"
"Sehr bedienerfreundlich, stabil, vielfältige Auswahlmöglichkeiten vorhanden. 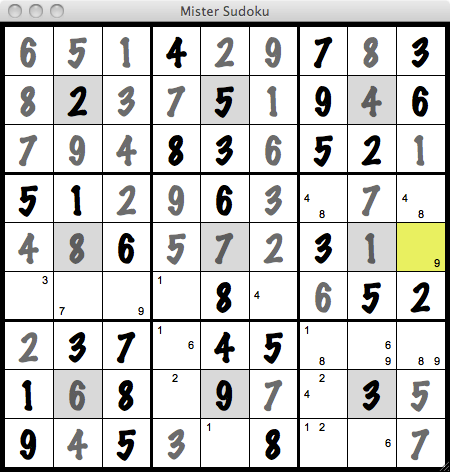 Ein Muss für jeden Sudoku-Fan!" "Εξαιρετικός βαθμός δυσκολίας σε killer, δυνατότητα pencil και σβήσιμο λαθών. Βελτίωση στο να βρίσκουν το άθροισμα με ένα πάτημα, και στις πιθανές επιλογές."